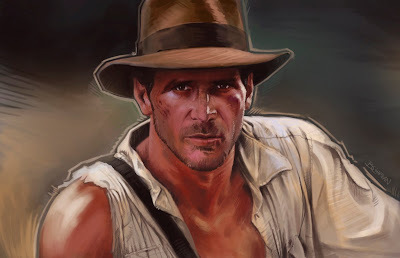 Well I've always been a big fan of Drew Struzan, so here I am blatantly ripping him off. Lets call it a tribute shall we...yes thats better. Here is my tribute to Drew. A man who must have gotten very tired of painting this handsome devil, over and over. I gonna try do more portraits going forward...we'll see how it goes. This piece also served as a bit of a reminder to me why I used to love Indiana Jones. Raiders is still my favorite flick of all time but don't get me started on Kingdom of the Crystal Skull. Indy! Nice one, Chaps. You totally nailed the likeness and the Struzan look. I wanna start doing more studies and portraits too- this will help motivate me! Hey Mr. B Chaps- stellar work as always, nice to see it all together here too! - very inspiring..